Aminopeptidase A (APA) is a 109 kDa homodimeric zinc-metallopeptidase that catalyzes the cleavage of glutamatic and aspartatic amino acid residues from the N-terminus of polypeptides. It is encoded by the ENPEP gene and is also known as glutamyl aminopeptidase, gp160 or CD249. It has been identified as a murine B lymphocyte differentiation antigen (BP-1/6C3) and a human kidney (gp160) differentiation antigen. 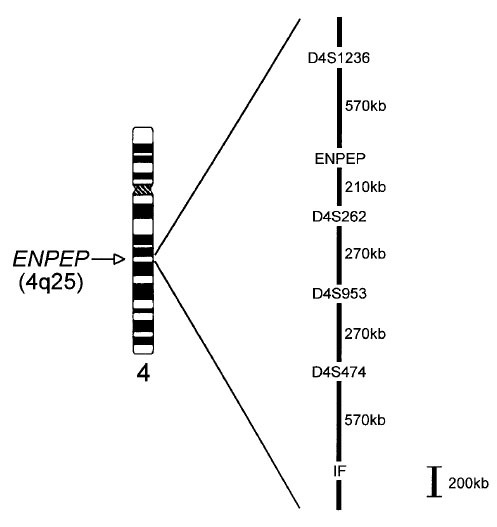 The ENPEP gene is localized on chromosome 4 (4q25), in a region of 87275 bp on the forward strand. The main gene transcript consists of 20 exons and encodes for a protein of 957 amino acids. APA is a single-pass integral membrane protein with a type II configuration. The membrane-bound form of APA is a homodimeric protein with an intermolecular disulfide bond. This bond is not essential for either dimer formation or enzymatic activity of the enzyme. APA is anchored at the plasma membrane by the transmembrane domain, a 22-amino acid hydrophobic segment, characteristic of type II integral membrane proteins, which separates a small N-terminal cytoplasmic domain (17 amino acids) from a large C-terminal ectodomain that contains the active site. In type II transmembrane proteins, the hydrophobic segment functions as both a permanent membrane anchor and an internal non-cleavable signal peptide that directs targeting to the endoplasmic reticulum. Within the C-terminal ectodomain there is a pentapeptide consensus sequence HELVH (His-Glu-Leu-Val-His) that is characteristic of zinc-binding metallopeptidases. The extracellular domain of APA is composed of two subdomains, a 107-kDa catalytic domain containing an HEXXH motif and a 45-kDa C-terminal domain. The C-terminal domain is required for the dimerization of the enzyme and acts as an intramolecular chaperone necessary for the correct folding, intracellular trafficking, and activity of the enzyme. In contrast, the N-terminal cytoplasmic and the transmembrane domains of the enzyme are not essential for the enzymatic activity. Thus, the soluble enzyme retains the characteristic enzymatic features of the membrane-bound enzyme. His-393, His-397, and Glu-416 in the HEXXH motif function as zinc ligands and are essential for the catalytic activity of the enzyme. Presumably, the zinc atom is coordinated by three ligands and a water molecule. 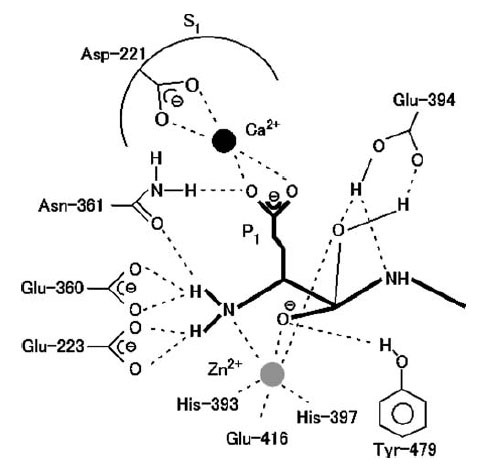 Glu-394 in the HEXXH motif polarizes the water molecule and promotes the nucleophilic attack of the carbonyl carbon of the peptide bond forming a tetrahedral intermediate. 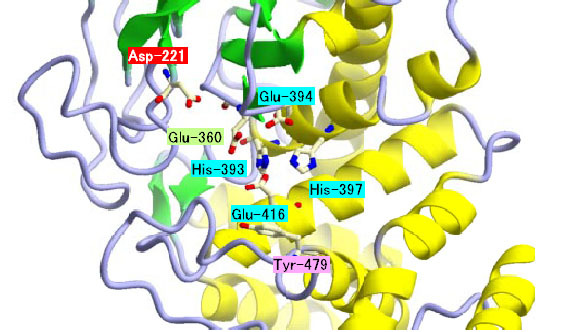 Glu-360 and Asn-361 in the GAMEN motif play roles in the exopeptidase specificity of APA through interaction with the N-terminal amino acid of the substrate. Tyr-479 of APA contributes to the catalytic activity of the enzyme by stabilizing the transition state complex through the interaction of the tyrosine hydroxy group with the oxyanion of the tetrahedral intermediate via a hydrogen bond. Recently, Asp-221 has been identified as an essential residue for Ca2+ modulation that plays an important role in the enzymatic properties of APA. In fact, replacement of Asp-221 with either Asn or Gln caused an almost complete loss of Ca2+ modulation of APA. Compared with the average amino acid percentage in vertebrates, APA contains a higher amount of leucine and asparagine, and a lesser quantity of cysteine and glycine. 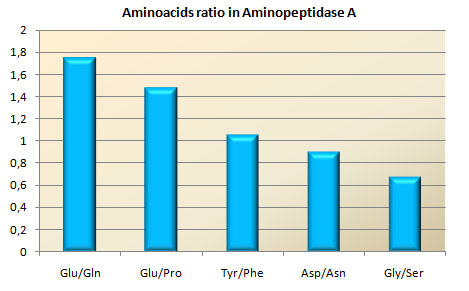 Aminopeptidases catalyze the cleavage of amino acids from the amino terminus of many proteins. They are essential for protein maturation, degradation of nonhormonal and hormonal peptides, and possibly determination of protein stability. Aminopeptidases remove the N-terminal amino acid from protein substrates. Aminodipeptidases, or diaminopeptidases, remove intact N-terminal dipeptides. Aminotripeptidases catalyze the hydrolysisof N-terminal tripeptides. from peptide substrate analogs, although bonds to many other residues are cleaved. Some peptidases are secreted, but most are not. There are soluble and microsomal enzymes, membrane-bound and cytosolic enzymes. Other aminopeptidases are found in organelles, such as lysosomes, nuclei, and mitochondria. There are acidic, basic, and “neutral” peptidases. APA belongs to the M1 family of zinc aminopeptidases , which consists of 11 enzymes in humans and shares the consensus GAMEN and HEXXHX 18 E motifs essential for the enzymatic activity. The M1 metallopeptidases are also called gluzincins since they bind a single Zn2+ ion for the hydrolysis of the substrate. Soluble, membrane-associated, or membrane-anchored M1 peptidases have been identified. Integral membrane M1 metallopeptidases represent a small subset of these enzymes and have the catalytic region exterior to the cell. Further, some soluble M1 metallopeptidases are secreted and, therefore, may be active both inside and outside of the cell. APA preferentially cleaves N-terminal acidic amino acids (glutamate and to a lesser extent aspartate) from several peptide substrates, such as angiotensin (Ang) II, cholecystokinin-8 (CCK8), chromogranin A and neurokinin B. A -- A peripheral membrane-associated M1 may be active in the endosomal population and at the plasma membrane. It may also interact with other proteins in the endosome and modulate their functions, such as signal transduction or processing peptides that are exported to or imported from the extracellular space. B -- An integral membrane M1 may have the same activity as a peripheral membrane M1. C -- M1 proteins may also co-traffic proteins to the plasma membrane. 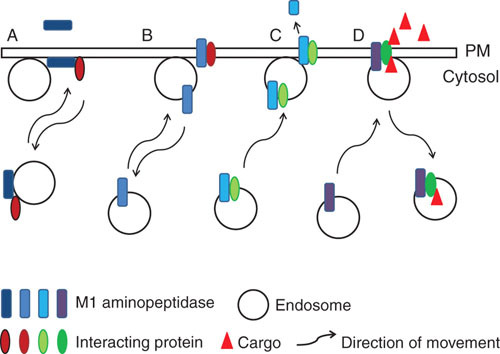 D -- M1 proteins may mediate uptake of cargo from the extracellular space via protein-interacting partners. APA is first synthesized in the kidney and placenta as a type II membrane-bound protein, some of which is then proteolytically cleaved and secreted into extracellular fluids. There, the catalytic domain of native enzyme is exposed to an hydrophilic environment and its function is regulated by the extracellular concentration of calcium ion (generally 1.0–2.0 mM). Among the M1 family of aminopeptidases, APA is the only enzyme whose activity is modulated by Ca2+. Ca2+ enhances or suppresses the hydrolytic activity of APA in a dose-dependent manner, according to the amino acid residues at the N-terminus of peptide substrate. Peptides having glutamatic and aspartatic amino acids at their N-terminus such as Ang II, CCK-8, and neurokinin B are cleaved by the enzyme efficiently in the presence but not in the absence of Ca2+. In contrast, kallidin (Lys-bradykinin) is converted to bradykinin efficiently only in the absence of Ca2+. Therefore, Ca2+ regulates the substrate specificity of APA, increasing its preference for the acidic amino acids, and thus functions as a blood pressure regulator through conversion of Ang II to Ang III. Zn2+ , which is known to be an effective inhibitor of various M1 aminopeptidases, suppresses the activity of APA dose dependently on all peptide substrates. 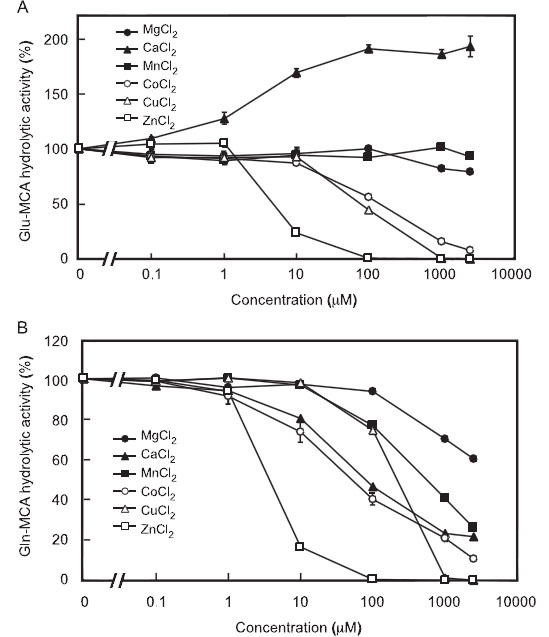 Cu2+ and Co2+ also suppress the activity although moderately, whereas Mg2+ and Mn2+ have little effect. APA is expressed on the brush border of intestinal and renal epithelial cells and on the vascular endothelium in many tissues, including kidney, intestine, placenta, and brain. APA is an important regulator of blood pressure because is one of the enzyme implicated in the renin-angiotensin system (RAS). In fact it is responsible for the conversion of Ang II to Ang III in the brain, which mediates the increase in blood pressure. Therefore, APA is a potential therapeutic target for the treatment of hypertension. There is a negative feedback for the regulation of APA in the RAS. In fact, vasodilator Ang IV can act as a competitive inhibitor of APA binding to its catalytic site. The inhibition of the APA-mediated conversion of Ang II to Ang III may have pathophysiological relevance by reducing the amount of Ang III generated in the brain RAS and lowering blood pressure. 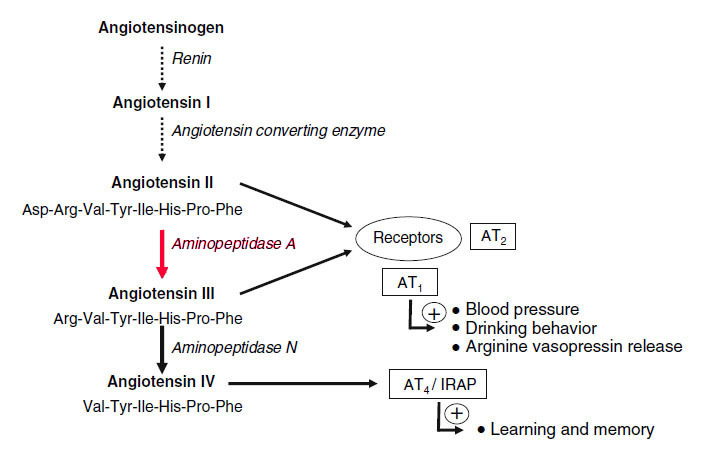 Amastatin and bestatin are efficient blockers of angiotensin metabolism because they inhibit aminopeptidase A (APA) and aminopeptidase N (APN), extending the half-lives of both AngII and AngIII. In fact, APA hydrolyzes the N-terminal aspartate of AngII to generate AngIII, whereas APN hydrolyzes the N-terminal arginine of AngIII to generate AngIV. Nevertheless, it was actually demonstrated that amastatin and bestatin are not selective with respect to AngII and AngIII. Indeed, amastatin is actually known to inhibit APN 40-fold more efficiently than APA, and bestatin displays broad specificity for various aminopeptidases. Recently, specific and selective APA inhibitors have been developed, such as EC33 ((S)-3-amino-4-mercaptobutyl sulfonic acid), in which the carboxylate group of the side chain of glutamate thiol is replaced by a sulfonate. EC33 is a specific APA inhibitor because is 100-fold more potent against APA than against APN. 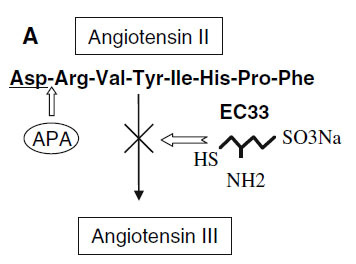 In vivo, EC33 increases the half-life of AngII by a factor of 2.6 and completely blocked the formation of AngIII. The increased metabolism of AngIII is responsible of the hypotensive effect of EC33. A prodrug of EC33, the RB150 (4,4’-dithio-bis(3-aminobutyl sulfonic acid), was obtained by dimerization of EC33 through a disulfide bridge. Experiments in rodent brain have shown that this bridge enables systemically injected RB150 to cross the blood-brain barrier (BBB) and to penetrate into the brain. There, the disulfide bridge of RB150 is cleaved by reductases releasing two active molecules of EC33 that inhibit brain APA activity, blocking the formation of AngIII and inducing a decrease in blood pressure. Therefore, RB150 may be the prototype of a new class of centrally acting antihypertensive agents. APA is also implicated in the pathogenesis of preeclampsia , hypertensive disorder of pregnancy. Compared with mothers, human fetuses produce equal or higher levels of AngII along with their growth or in response to various stresses. Placental proteases could metabolize excessive peptides derived from the fetus as a barrier between the mother and fetus. Indeed, APA activity in maternal serum increases during normal pregnancy possibly to maintain feto-maternal homeostasis. In patients with preeclampsia, APA activity shows biphasic changes. In mild preeclamptic patients, serum APA activity elevates above normal range, which may indicate the counteraction to the activated RAS; when preeclampsia gets worse, APA activity decreases, leading to an increase in blood pressure. Furthermore, preeclamptic patients are generally sensitive to the pressor effect of AngII contrary to the refractoriness in normal pregnant women. Hypersensitivity to exogenously infused AngII is also observed in APA-deficient mice, suggesting that APA may play a critical role in acquiring the refractory activity to AngII.